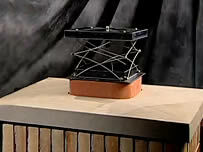 Top Mount Chimney Dampers are devices for saving energy that are installed on top of a chimney to shut the flue when the chimney is not in use as well as regulate the amount of draft needed when burning a fire. These are often used as replacement dampers for the traditional fireplace throat dampers that are installed just above the firebox when a masonry chimney is built. These top sealing dampers are much more effective than throat dampers as they provide a silicone rubber gasket seal instead of metal to metal seal that doesn’t allow saving of energy. At Creative Masonry & Chimney, we will help you with choosing and installing the correct type of damper system for your chimney. The Lyemance and Lock-Top dampers are as much as 90% more efficient than throat dampers. These dampers are highly efficient and these ensure that the heating and cooling effects remain in your home and keep your bills at an optimum level. In case you have an old throat damper installed in your chimney, contact us today to have it replaced with a new-age and advanced chimney damper that will save you as much as $200 worth of heating and cooling a year. Get in touch with our professionals who will guide you how to go about the replacement of your old chimney damper. The average cost of a top mount energy-saving damper will vary depending on the style, size, and difficulty of the installation. After doing this for many years we have found the average price is between $299.99 – $399.99 including installation. This is a bargain considering the energy saving in one year just about pays for it.